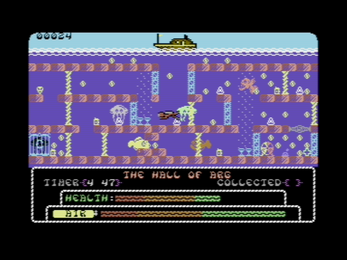 This game was released as a physical Commodore 64 version on tape in november 2018. 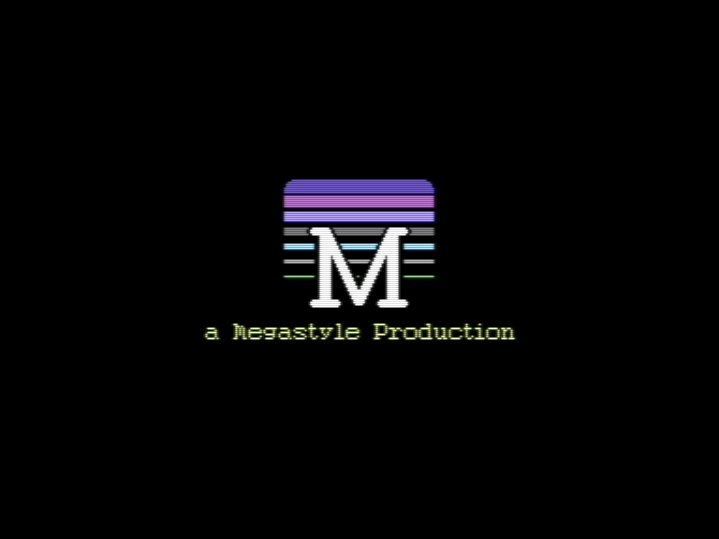 The game sold out in only 32 hours, but we are currently working on making another batch, this time as both disk and tape versions. Please visit this page for more info about how to secure yourself your own physical edition of Exploding Fish. In the meantime, download this digital version and we hope you enjoy the game. The evil Doctor Drax has been busy, dropping bombs onto the protected reefs. 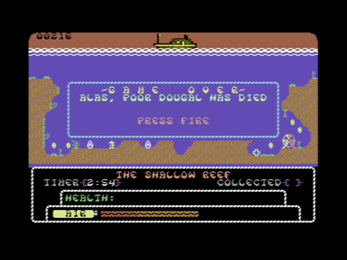 Take control of Diver Dougal. 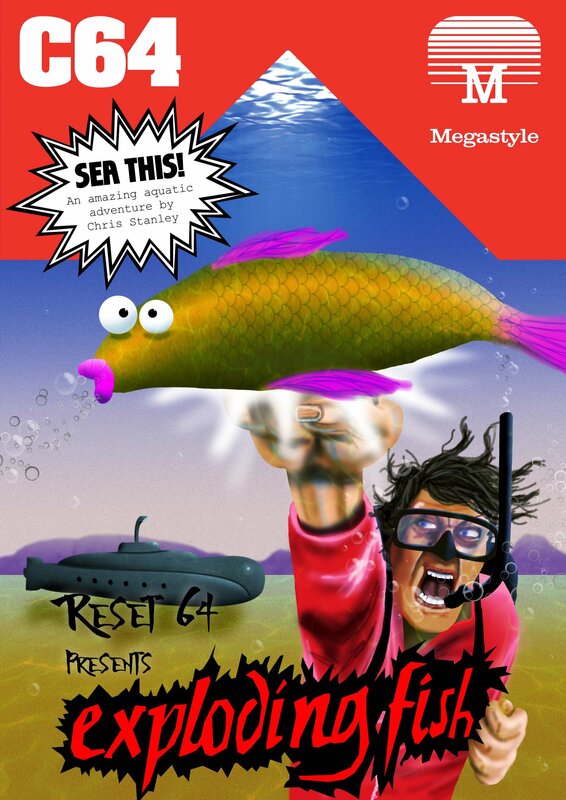 Dive deep, defuse bombs, avoid nasties... and watch out for alien artefacts! Collect all the encryption keys in order to access & defuse the bombs. Better watch out for the sea life though... Those creatures really hate intruders! So set sail on the - Unsinkable 2- and make the sea a safer place. 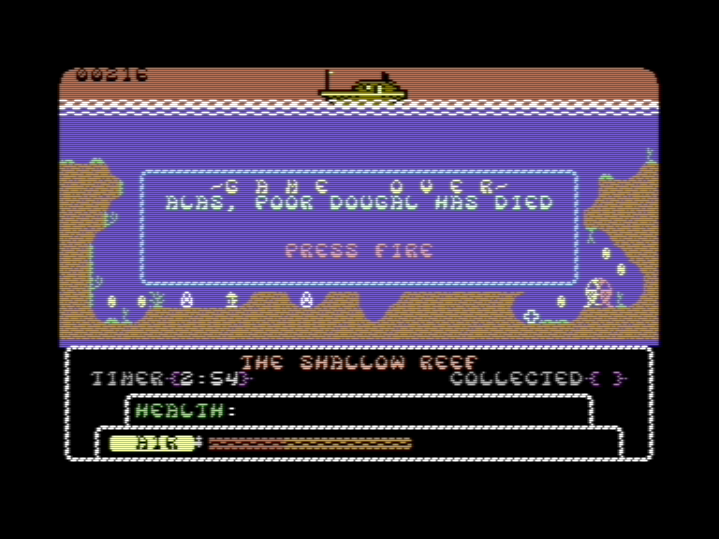 Your trusty boat, the Unsinkable 2 enters from the right and drops Dougal in the water. From there you must swim down and collect each of the five encryption keys in turn and take them to the end-portal. Each time a key is used, the display on the portal will show how many more keys are needed. 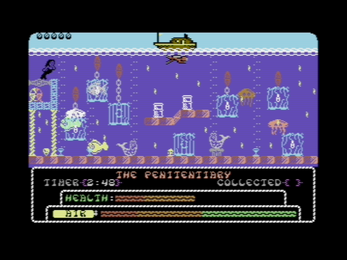 When all keys have been used, the portal will dissolve and Dougal will be able to access the bomb. This must be collected and returned to the boat before the countdown timer elapses. If that happens, it's well and truly game-over… BOOM! Successfully returning the bomb to the boat is the goal of each level. Dougal will climb back onboard the Unsinkable 2 which will take him off to save the next reef! Any remaining time on the countdown timer will be converted to bonus points before the next level begins. On each level there are other collectables to find. Air cylinders and medipacks replenish air and health respectively. Occasionally the player will come across an alien artefact, no doubt dropped accidentally from a passing flying saucer! Collecting one of these is always a gamble. There are a random mixed bag of about 15 different effects this could have, some good but some bad. 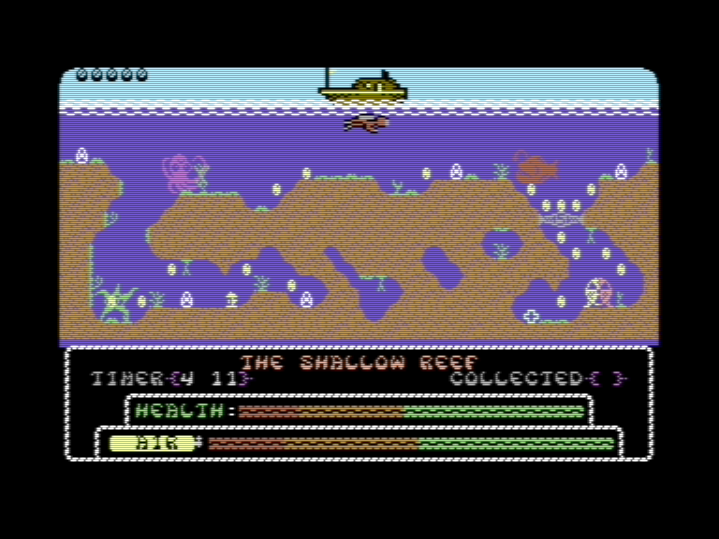 You must battle your way from reef to increasingly difficult reef until you eventually reach Dr. Drax’s secret dock. That’s your chance to finish him off for good, but be warned- he’s no pushover! 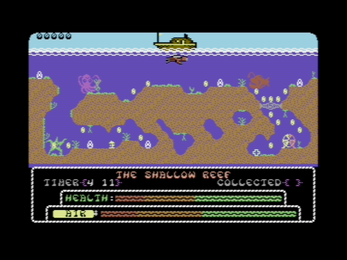 The game is controlled with a joystick in port 2. Use the SPACEBAR to pause. Keep a close eye on the countdown timer, if it reaches zero then it’s all over! Press fire to collect the various items scattered throughout each level - trianguar encryption keys, air cylinders, medipacks or alien artefacts. There’s also a lot of treasure scattered about in the form of gold coins. Simply swim into these to collect them for a healthy score boost! Please note that you can only hold one encryption key at a time. Take each one to the bomb portal and press joystick-down+fire to use the key. The number shown on the portal will decrease, telling you how many more keys are needed. Once you have used all 5 keys then the portal will dissolve allowing you to collect the bomb. Better get it back to the boat as soon as possible! As you swim around underwater, the air in your cylinder will slowly be used up. Collecting air cylinders will give your air level a much needed top-up. Don’t let your air reach zero otherwise your health will start to deplete! 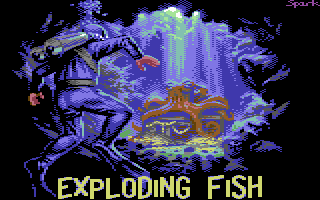 Each level has it’s share of genetically modified fish, all released by Dr. Drax to keep unwanted meddlers at bay! Allowing any of these to touch you will result in you losing a chunk of your health. Also watch out for Mermaids, normally they are quite peaceful they can’t resist stealing air from passing divers! Whenever you begin a new level, your air will have been fully replenished but only some of your health will have been restored so be careful! swimming close to the surface wherever possible will preserve your air supply because Dougal can breathe through his snorkel. Every time you complete a level, you will be given a code for the following level. Always make sure you write these down as they can be entered on the title screen and used to begin subsequent games without having to start from level 1 each time. There’s no such thing as a free lunch as the saying goes, so be aware that the higher the level you jump to, the less health you will start with! Thanks to Vidar Bang, David Eriksson, Ruben Spaans and Chris Ledger for helpful suggestions and testing the game. Hello Stephen, a mail is sent to you with the d64 file! Thanks again for the support. Is this game NTSC compatible? Love the theme from "The Fog" One of my fav horror films! Thanks you!! Our composer, Rage has had that tune lying around on his workdisk for quite some time, and when Sparkler made that dramatic loading picture we tought that tune would fit perfectly for the diskversion. Just bought it! Nice game btw! Thanks for the support!!! Really appreciated! Good luck guys. I hope you gets lots of buyers.